Finally adding a very small review about Twitter Power by Joel Comm. It was disappointing. In short, Twitter Power provides an overview of what twitter does as well as giving some general pointers on how to use twitter. It’s the tweeting basics, in other words. I was disappointed with Twitter Power, especially after reading the many reviews that claimed this book would reveal many techniques for both beginners and pros alike. For anyone that has been using Twitter for more than a couple weeks, this book is really 101. It seems to be geared towards people that have never heard of Twitter or are just getting started. If that’s the case, this book will help you get your feet wet, but it doesn’t shed light on anything you can’t pick up on your own simply by using Twitter for a few days. Twitter is real time with instant response in most cases, and you’ll find out what works for you and what doesn’t almost immediately. You can also pay attention to the power players and note their approach. The book just points you to the top users on Twitter anyways. Save your money and do a little homework. Another problem with this book, which I should have anticipated having previously read Joel Comm’s The Adsense Code, was that books about the internet’s latest stuff, even when bought extremely close to their completion, have a decidedly out of date quality to them by the time they are read. In the case of The Adsense Code, I even took some of the information to bat regarding certain Google policies only to be rebuffed by a friend who informed me that their policy had changed. Oof! 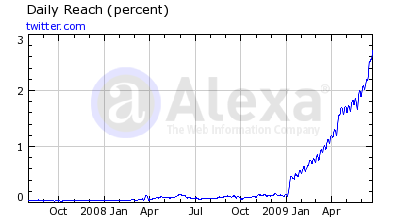 With twitter, just look at this graph of twitter’s traffic from alexa.com. Twitter Power came out on February 17, 2009. In other words, assuming Joel more-or-less finished this book a good month or so before it went to publish, the “twitterverse” about which he wrote is no longer the twitterverse we have today. Sure, much of it has stayed the same, but much of it has also changed. My conclusion: the model of reading-books-about-the-Internet is broken. Finally, and I’m sure Joel Comm is a super guy, but I follow @joelcomm on twitter in hopes of gleaning knowledge about how a pro tweets and even that disappoints. For some great examples of twitter-users worth following, check out @mikemueller or the fantastic @gregormacdonald. But don’t waste your time on Twitter Power.